Actress Selma Blair made her first public appearance since revealing she has multiple sclerosis (MS) at the Vanity Fair Oscars Party. And she arrived in style, walking the red carpet in a gorgeous number with the help of a cane. On Sunday, Feb. 24, 2019, all the biggest stars came out for the 91st Academy Awards, and even those who didn't attend the award ceremony went all out for the event's famous after parties, including, most notably, Vanity Fair's party in Beverly Hills. Among those guests was Blair, who rocked a stunning multi-colored gown by Ralph & Russo with stripes of black, pink, mint green, and light blue, as noted by InStyle. She turned heads in the gorgeous dress, as she used a cane to walk the red carpet ahead of the party. The black cane was customized for Blair's party appearance. According to a photo Blair posted on Instagram, the former Cruel Intentions star's manicurist, Tom Bachik, added her initials, "SB," to the cane, along with a pink diamond. "How did I get so lucky?" Blair, 46, asked in the post. Blair also revealed that producer David Lyons found her patent leather for the cane and costume designer Bic Owens added it to the walking stick, as she "wanted a special cane" for the event. "Hours of love put in. And then #tombachick made it especially magical. I burst into tears. These gifts to get me through," Blair added in her Instagram post's caption. "I can't thank these three enough. There are angels." With her beautiful dress and her personalized cane, Blair clearly was feeling her look. "When my life flashes before my eyes, I want this portrait by @markseliger to be front and center," she said alongside a photo taken at the event. And plenty of other people were feeling Blair's look too. And really, how could they not? "The real winner of Oscar night is Selma Blair," one Twitter user wrote. "In her first public appearance since her MS diagnosis, using her cane to help her down the red carpet at the VF Oscar Party, she was wearing inspiration. And It looks damn good on her." 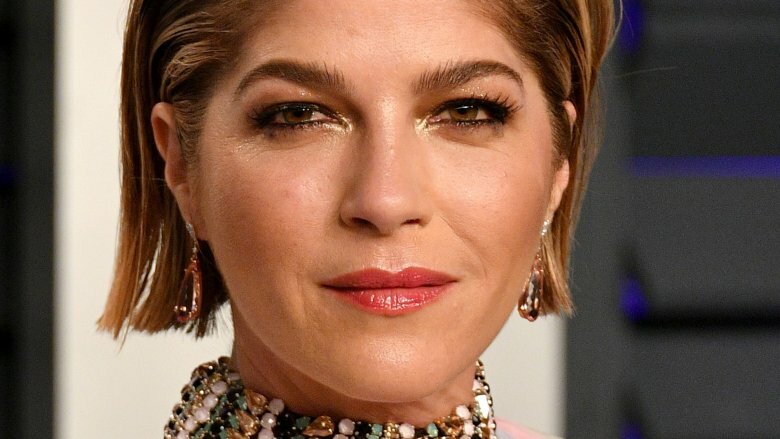 Another tweet read, "The moment we will all be talking about tomorrow is the courageous #SelmaBlair, making her first appearance since announcing her MS diagnosis, at the VF Oscar party. She needs a cane to help walk, but she came to prove that no matter how tough this disease, she is a fighter." Blair previously opened up about being diagnosed with multiple sclerosis, or MS, back in October 2018. Sharing a photo of herself, she revealed to her Instagram followers that she had received a diagnosis of the autoimmune disease the previous August. "I have #multiplesclerosis. I am in an exacerbation. … I am disabled. I fall sometimes. I drop things. My memory is foggy. And my left side is asking for directions from a broken gps," she wrote. "But we are doing it." She continued, "I am in the thick of it but I hope to give some hope to others. And even to myself. You can't get help unless you ask." She noted, "I have had symptoms for years but was never taken seriously until I fell down in front of him trying to sort out what I thought was a pinched nerve. I have probably had this incurable disease for 15 years at least. And I am relieved to at least know." According to Mayo Clinic, with MS, "the immune system attacks the protective sheath (myelin) that covers nerve fibers and causes communication problems between your brain and the rest of your body." This can lead to the damage and deterioration of nerves. Symptoms can vary among those diagnosed, but may include weakness in arms or legs, tremors, vision loss, fatigue, and slurred speech, among others. It's not uncommon for sufferers to "lose the ability to walk independently or at all." There's currently no cure for the disease, but sufferers can receive treatment to help aid recovery for "attacks," to manage symptoms, and to slow down the disease's progression. After sharing news of her MS diagnosis, Blair further commented on just how the disease affects her personally. "Going out, being sociable holds a heavy price," she stated in a January 2019 Instagram post. "My brain is on fire. I am freezing. We feel alone with it even though the loving support has been a godsend and appreciated." Though she admitted that her day-to-day life can be very difficult, she said, "My life is not about suffering. … I am succeeding and love my life."